I forget whether I posted something on Twitter to this effect or simply kept the thought to myself, but there was a point in time at which I would have given Newt Gingrich not more than a 1-in-1,000 chance of winning the Republican nomination. That may have been foolish. This year’s Republican nomination process, if nothing else, has reminded us how often things don’t go to plan and how unpredictable the primaries can be. Lately, Mr. Gingrich has been showing some signs of life. He has averaged 13 percent of the vote in polls conducted of Republican voters so far in November, his third straight month of improvement after he bottomed out at 5 percent in July and August. There’s also some evidence that Mr. Gingrich tends to be competing for the same types of voters as Herman Cain, so if Mr. Cain’s campaign begins to erode support, Mr. Gingrich could be the beneficiary of that. 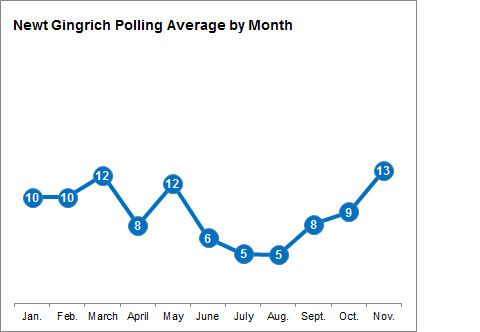 Perhaps more surprising is the rebound in Mr. Gingrich’s favorability ratings among Republican voters. According to Gallup’s tracking poll, Mr. Gingrich is now viewed favorably by 55 percent of Republican voters and unfavorably by 23 percent, a big improvement from June when those numbers were 42 and 31 percent, respectively. Early State Polls and Positioning Somewhat contrary to the perception that Mr. Gingrich is running a national book tour rather than a serious campaign for the White House, he has spent most of his time in the key early-voting states. Based on Politico’s candidate tracker, I show Mr. Gingrich as having held 11 events in Iowa between Sept. 1 and Oct. 31, along with seven in Florida and five in South Carolina. He has spent very little time in New Hampshire, but overall he made 25 appearances between the four states during this period, about the same number as Mitt Romney (26). Polls suggest that Mr. Gingrich is right to concentrate on the other three states at the expense of New Hampshire: his numbers lag his national support by several points in the there, while running roughly in line with it in the others. It’s conceivable that Florida and South Carolina could turn into strengths for Mr. Gingrich. He is from Georgia, which neighbors both of them, and polls find that Mr. Gingrich runs relatively strongly among older voters, which will be helpful to him in Florida. But he will probably have to perform strongly in Iowa to get to those states in decent shape, and although recent polls show his numbers improving there, he lacks infrastructure in Iowa and fared very poorly in the Ames Straw Poll. Endorsements and Party Support. Mr. Gingrich has a half-dozen endorsements from Republicans in the U.S. House, but almost all of them came toward the start of his campaign in May and all but two of them are from his home state of Georgia. (He also has the endorsement of Georgia’s governor, Nathan Deal.) Mr. Gingrich has very few endorsements in key early-voting states. Some endorsements are better than none, and Mr. Gingrich has more from members of the Congress than candidates like Herman Cain (who has just one), Representative Michele Bachmann (zero) and Jon M. Huntsman Jr. (also zero). It’s important to remember that relatively few Republican party leaders have made endorsements of any kind so far, and it’s certainly not impossible to imagine the former speaker of the House finding support within the Republican establishment. For the time being, however, the low endorsement total qualifies as a weakness for Mr. Gingrich. Fundraising and Campaign Infrastructure. Mr. Gingrich’s fundraising has been simply abysmal — just $2.9 million brought in through Sept. 30. Not only that, but as of Sept. 30, Mr. Gingrich had only $353,000 in cash on hand but $1.2 million in debt. There’s some question about whether fundraising is more of a lagging or a leading indicator; the money sometimes follows the polls. But it is hard to see how numbers like these are anything other than a huge problem for Mr. Gingrich. What they may really point toward is his lack of a robust campaign infrastructure, caused in part by numerous staff defections early in this campaign. He may even be in something of a Catch-22: it’s hard to hire staff if you don’t have money, but it’s hard to raise money if you don’t have any staff. Whether Mr. Gingrich makes a credible effort to address these issues over the next several weeks will be a good sign of how seriously his surge should be taken. Ideological Positioning. Mr. Gingrich got himself into trouble early on with his apostasies over Rep. Paul Ryan’s budget plan. But most every Republican candidate has one or two positions that they now find inconvenient, and Mr. Gingrich’s overall ideological positioning isn’t bad given the mood of the Republican electorate. We did not include Mr. Gingrich in our recent magazine feature on Republican candidates that rated their ideology from center to right on a 100-point scale, but his score would be fairly close to that of Gov. Rick Perry, which in my view represents something of a sweet spot for the Republican primary electorate: solidly conservative but not in Michele Bachmann territory. Mr. Gingrich is also fairly well positioned on what I call the establishment-insurgent axis; he can claim to know how Washington works while also seeming like an outsider since he has been out of it for some time. This, overall, is one of Mr. Gingrich’s greater strengths: one can imagine him being acceptable in theory to a fairly broad array of conservative voters. Electability and Personal Liabilities The downside to being acceptable to most conservative Republicans is that you may not be ideally positioned for the general election. I don’t place a lot of emphasis on horse-race polls this early out, but Mr. Gingrich trails President Obama by 11 points in recent surveys, about the same as Mr. Perry. Our forecasting model, which is based on ideology ratings rather than these polls, suggests that he might ultimately run a net of about 4 points worse than someone like Mitt Romney nationally. Of course, in the context of a nomination race, the perception of electability may be more important than the reality of it. But those numbers are quite poor for Mr. Gingrich as well. In the recent ABC News/Washington Post poll, just 5 percent of G.O.P. voters identified him as the candidate with “the best chance to defeat Barack Obama in the general election,” well below the 11 percent support he had overall in the survey. Meanwhile, although Mr. Gingrich’s personal favorability rating has rebounded a great deal among Republican voters, he has some image problems that could come back to harm him should he rise in the polls and receive more scrutiny from voters and the media. The most obvious problem is Mr. Gingrich’s two divorces, a subject that may receive more attention given the recent focus on the sexual harassment allegations against Mr. Cain. Mr. Gingrich may also not be as thoroughly vetted as candidates like Mr. Romney and Mr. Perry, who have run for office more recently. Finally, there’s the fact that Mr. Gingrich is anything but a new face to voters and is associated with an exceptionally unpopular institution, the United States Congress. Overall, I would read three of these factors, establishment support, personal liabilities, and (especially) fund-raising, as being clearly negative for Mr. Gingrich. This contrasts against one, ideological positioning, which is potentially favorable for him. He has both strengths and weakness in the key early-voting states, meanwhile. That balance is unfavorable enough to suggest that his chances of winning the nomination are weaker than his polls alone would imply. That certainly does not mean that his chances are zero, or 1,000-to-1 against. If Republican voters decide that they really don’t want to nominate Mitt Romney, Mr. Gingrich could be the last man standing. But even if Mr. Gingrich continues to gain in the polls, he will have some major weaknesses to overcome.